FINALLY, two weeks after the opener, foreign players are able to play in the Premier Volleyball League Reinforced Conference. 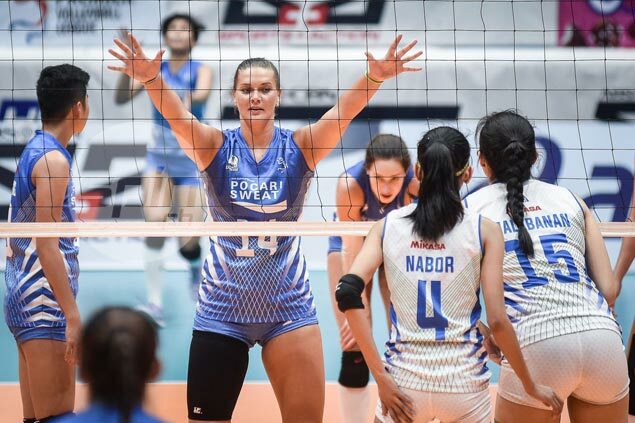 Edina Selimovic and Michelle Strizak of Pocari Sweat along with Jeng Bualee and Jennifer Keddy of BaliPure saw action after the players’ International Transfer Certificates were issued on Thursday. Pocari Sweat tandem Selimovic and Strizak were pleased that weeks of frustration finally ended. “It feels great to finally (play) me and Michelle we could feel how it’s actually to be on the court with the team and losing and winning the points together,” said Selimovic, the Bosnian middle blocker who has been in the country since January. “It was frustrating because we are working and practicing together everyday and we just come here to watch the games,” she said. “So it’s just sad because I feel we couldn’t help our team and that was the worst feeling for us,” she added. Strizak arrived a month before the tournament, and is also just happy to finally get on the court. Keddy had a tough few week, at one point being given the green light to play only to learn at the match venue she is barred from seeing action. “This for me, with that, which was annoying but I’m glad now we did play,” said Keddy. Bualee was glad the issue has been resolved, although the 33-year old spiker, back five years after lifting Sandugo-San Sebastian to the title, lost her first match in the PVL as Balipure squandered a two-set lead to Pocari Sweat. “We’ve been waiting for so long. We thought we cannot play anymore. For me I really want to play. I don’t want to come back (in the Philippines) for nothing,” she said. “I’m really happy (to play again in the Philippines) because many fans were asking me when will I be back. I’m so lucky that they want me back here. For me I’m really happy talaga,” she said.